302 Commonwealth is located on the south side of Commonwealth, between Gloucester and Hereford, with 300 Commonwealth to the east and 304 Commonwealth to the west. 302 Commonwealth was designed by architect Obed F. Smith and built in 1880-1881 for Uriah H. Coffin, a building contractor, for speculative sale, one of two contiguous houses (300-302 Commonwealth). Uriah Coffin is shown as the owner on the original building permit applications, dated September 13, 1880 (for 300 Commonwealth) and November 11, 1881 (for 302 Commonwealth, with a notation that the “plans are duplicate” of 300 Commonwealth). Click here for an index to the deeds for 302 Commonwealth. On September 6, 1883, 302 Commonwealth was purchased from Uriah Coffin by Ann E. (Dutton) Mandell, the wife of Samuel Pierce Mandell. They previously had lived at 12 Union Park. Samuel Mandell was a dry goods merchant and also was publisher of the Boston Transcript newspaper, which had been founded by Ann (Dutton) Mandell’s father, Henry Worthington Dutton. Ann Mandell’s unmarried sisters, Lydia W. Dutton and Mary M. Dutton, lived with them. Lydia Dutton died in January of 1899, and Mary Dutton died in April of 1901. Ann Mandell died in January of 1918, and Samuel Mandell died in February of 1920. 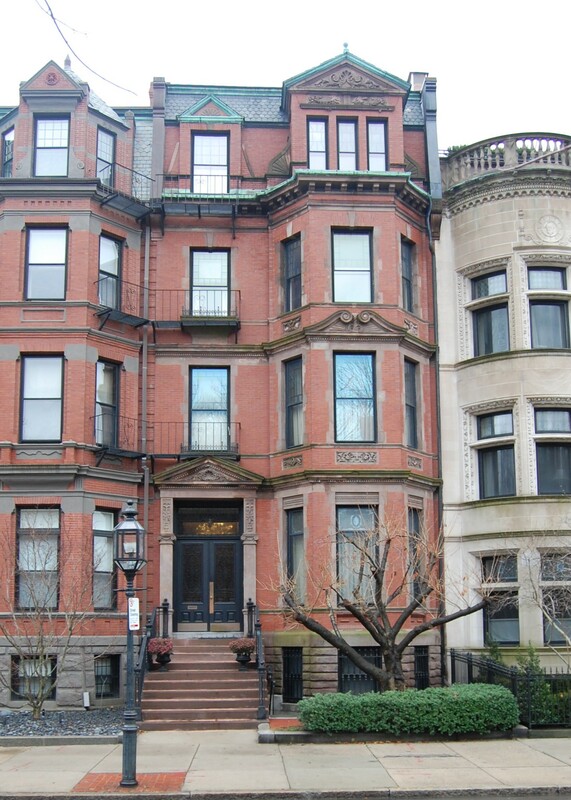 302 Commonwealth was not listed in the 1921 and 1922 Blue Books. 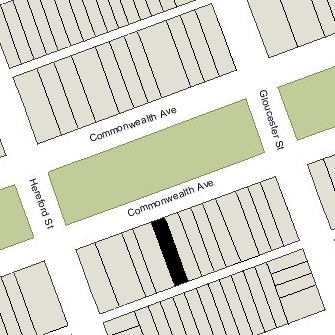 On June 14, 1921, 302 Commonwealth was purchased from Ann Mandell’s heirs by real estate broker William J. Stober, and on June 5, 1922, it was purchased from him by Lena J. (McDonough) Taber, the widow of William W. Taber. In 1920, she and her husband had operated a lodging house at 142 Beacon. He died in July of 1920, and she moved to Brighton. She lived at 115 Newbury before moving to 302 Commonwealth. In July of 1922, Lena Taber applied for (and subsequently received) permission to remodel the interior to create a new bathroom on the third floor. She did not indicate any change in the building’s use, but it appears that she operated it as a lodging house and, in 1922 and 1923, as the location of the Phi Mu Gamma sorority. In May of 1929, Lena Taber was cited by the Building Department because of insufficient egress at 302 Commonwealth, and in November of 1929, she filed for (and subsequently received) permission to install a fire escape on the rear of the house. She continued to live there during the 1929-1930 winter season, but moved thereafter. By April of 1930, 302 Commonwealth was the home of Mrs. Mary Agnes (called Agnes) (Witter) Lindsey Hobart, widow of John Sumner Lindsey and of Edward Ellis Hobart. Prior to Edward Hobart’s death in January of 1928, they had lived in Plymouth, where he was Clerk of the County Court and she was principal of the Plymouth High School. Her niece, Miss Alice Manning Wright (daughter of Edward Gilmore Wright and Eliza Lyon Witter), lived with her. By 1931, they had moved to 212 Commonwealth. On October 25, 1930, 302 Commonwealth was purchased from Lena Taber by Gustaf Ivar Bylin, a printing machinery dealer in Malden. He and his wife, Edla C. (Borne) Bylin, made it their home. They previously had lived in Malden. On January 27, 1931, Alfred J. Benfield, a mortgage broker, foreclosed on a mortgage given by Gustaf Bylin and took possession of the property. The Bylins moved back to Malden. By 1931, 302 Commonwealth was the home of George H. Chase, a house painter, and his wife, Minnie Oley (Emery) Blair Morse Chase, who operated it as a lodging house. They previously had lived at 4 Dartmouth Place. 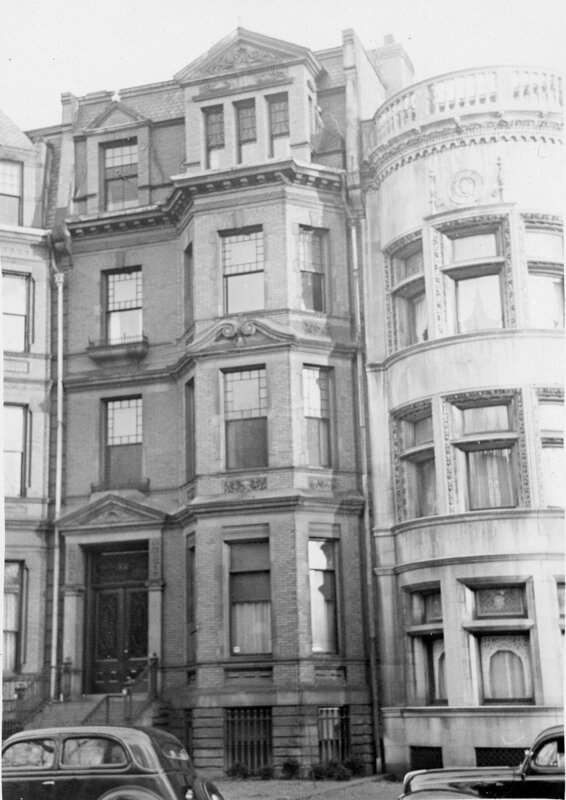 They continued to live at 302 Commonwealth in 1933; by 1935, they were living in an apartment at 291 Commonwealth. On February 27, 1934, the Middleborough Savings Bank foreclosed on a mortgage it held on 302 Commonwealth and took possession of the property. On March 23, 1934, Edla (Borne) Bylin re-acquired 302 Commonwealth from the Middleborough Savings Bank. Gustaf and Edla Bylin moved back and operated it as a lodging house. On October 8, 1937, Middleborough Savings foreclosed on its mortgage and the Bylins moved back to Malden, where Edla Bylin died in May of 1938. On April 15, 1938, 302 Commonwealth was acquired from the Middleborough Savings Bank by Frank P. Adduci and his wife, Sarah K. (Gardner) Adduci, who operated it as a lodging house. They previously had lived in Augusta, Maine. He was a musician. The Adducis divorced in the mid-1940s, and in September of 1945 he transferred the property into Sarah Adduci’s name. He subsequently moved to Las Vegas, Nevada, where he married again, to Marion Gloria Skinner, and became the bandmaster of the National Guard band. Sarah Adduci continued to live at 302 Commonwealth. In October of 1949, she filed for (and subsequently received) permission to convert the property from “private use – room rental” into six apartments. However, she appears to have continued to operate the property as a lodging house. By about 1960, she lived in one of the apartments, operating the “Tourist and Traveler Service” from her home. The remainder of the building appears to have been used as a combination of a rooming house and apartments. She continued to live at 302 Commonwealth until about 1972. It was shown as vacant in the 1973 City Directory. On December 2, 1974, 302 Commonwealth was acquired from Sarah Gardner Adduci by Russell Arthur Gaudreau, Jr., a lawyer, and his wife, Elizabeth (Flanagan) Gaudreau. They previously had lived in an apartment at 21 Beacon. On December 30, 1986, 302 Commonwealth was purchased from the Gaudreaus by Robert Collier and his wife, Judith H. Collier. On July 3, 1987, they converted the property into six condominium units, the Commonwealth 302 Condominium.